Billionaire Stan Kroenke wished to take his NFL team to California. Yet he missed one thing about Missouri: the labor laws. 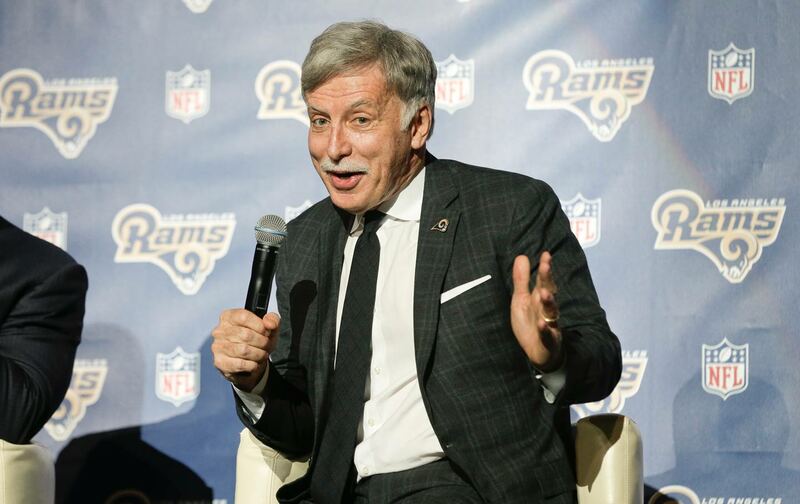 We have, at long last, reached the point where Rams owner Stan Kroenke finally evinces a modicum of shame. It didn’t come when the billionaire real estate baron took his NFL team out of St. Louis while sticking the cash-strapped city and state with a $129 million bill for what is still owed on the team’s stadium. It didn’t come when he rejected $500 million in taxpayer money to stay in St. Louis, saying, “I couldn’t sit there and be a victim.” It certainly didn’t happen when he treated St. Louis like an old septic tank, even though he is a such a son of “the Gateway of the West” that his very birth name, Enos Stanley Kroenke, is a tribute to St. Louis Cardinal heroes Enos Slaughter and Stan Musial. But now it has finally come. There is apparently one thing about St. Louis that Kroenke still loves, and that is the state’s threadbare workers’ compensation laws. He just attempted to have his players remain employed under Missouri’s workers’ comp laws, even though the team has relocated to California. It was shameful. Kroenke wanted the California Dream while also having that hard-right Missouri legislature watching his pocketbook. Luckily, the NFL Players Association caught him in his devious act. The subsequent publicity proved too much for Kroenke, and all right, maybe it wasn’t shame, but for once he actually buckled and said that the players on the Rams would now be classified as California workers, since, you know, they’re in California. At least we didn’t have to go to court over this one. As always, when they want something from us, we are called “business partners,” but every player needs to know that a union is something that has to remain vigilant in protecting every player’s rights. With the NFL lately, we seem to be adversaries every day…. Workers’ compensation is a right of every American worker and is not just for athletes. When the owners of professional sports teams actively try to circumvent this right, or try to rewrite legislation that carves out athletes from this right, our union will always fight back. When corporations relocate, they are governed by the law of the state to which they relocate. In fact, this is one of the reasons that many corporations relocate! For instance, a textile company that leaves New Bedford, Massachusetts, and moves to Columbia, South Carolina, is governed by the laws of South Carolina. Even if there was a pro-worker business, they could not say that, despite the fact that South Carolina is a right-to-work state, that the company will be governed by the laws of Massachusetts, which does not permit so-called right to work. I can see no legitimate justification for the position originally taken by the management of the St. Louis Rams. There may be circumstances where the headquarters of a company is in one state and some of their operations are in another, but even then the operations are governed by the law of that jurisdiction. The stand taken by the management of the St. Louis Rams is outrageous. It reminds one of the so-called yellow dog contracts that workers were forced to sign in the 19th and early 20th centuries, in which they were, in effect, ordered to abdicate their rights to join or form a trade union in order to secure employment. What the Rams management appeared to be doing is a 21st-century version of such economic blackmail. The part of this story that is so gobsmacking is the fact that Kroenke went down this route at all. He’s like Montgomery Burns, poised to block out the sun, but unable to resist stealing candy from a baby. Or Donald Trump amid a quest for the greatest prize in politics, taking the time to fight lawsuits levied by disgruntled students hoodwinked into taking classes at Trump University. He is about to be handed 300 acres of prime Los Angeles real estate to build “the most expensive stadium in history,” but it wasn’t enough. This has been described as “an unforced error” by Kroenke. The city of Los Angeles, the NFLPA, and everyone in the Rams organization will need to be vigilant. From what we know of Kroenke’s history and character, there will be more “errors” to come.